LAS VEGAS: The Consumer Electronics Show (CES) concluded on Saturday with over 140,000 total visitors and 2,700 exhibitors representing a huge range of products and companies, from the largest technology giants like Microsoft and Sony to small startups — and now, media companies. Laurie Ann Phillips, Senior Director of Communications at CES, told Publishing Perspectives that consumer expectations are also having an impact on how device makers and media companies work together, and consequently who comes to CES. “People want content on their gadgets,” she said. “It’s not just about being able to connect and communicate with other human beings,” but also about watching movies, reading books, and consuming content on various devices. As technology becomes an integral part of both creating and distributing content, the deals and partnerships that get the content onto different devices become increasingly important to media companies, device makers and the distribution companies that act as the go-between. And while the flashing lights and cool product demos on the show floor at CES create an atmosphere of giddy excitement, serious dealmaking is going on behind closed doors. 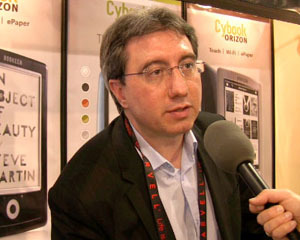 For companies like Bookeen, a Paris-based maker of e-reading devices, CES is both an opportunity to market and to meet with retailers, distributors and publishers. Co-founder Laurent Picard said he can measure the success of his time at CES by “the number of deals we sign.” The business model for Bookeen relies on partnering with retailers throughout Europe, as well as sales through its own e-book store. In some cases, Picard said, Bookeen works with content aggregators to get content for its devices, and sometimes directly with publishers. And as “more and more” publishers are coming to CES, it’s an opportunity to put several partnerships into place at once. CES made it obvious just how blurry the lines are getting between hardware, software and content companies. Many hardware companies are now also software companies and work directly with content providers in order to offer the widest range of content to their customers. The reverse is also true as media companies now build software and applications for their content and work with hardware manufacturers. For example, OverDrive, an e-book distributor, is one company taking advantage of this overlap in technology and content at CES. After recently launching a suite of apps that allow people to download, or borrow, e-books from their local library on various devices, David Burleigh, the director of marketing for OverDrive, told Publishing Perspectives, “we’re talking to just about everybody here . . . about integrating apps or providing APIs or building stores” so that consumers can read e-books on their devices. This approach appears to be working. Burleigh also said that “because of all these new devices and new awareness that you can borrow books from libraries and put them on your devices,” all of the libraries that OverDrive supplies have seen “big increases in circulation.” He also said that by working closely with hardware companies like Sony, OverDrive can create apps for those readers, making it easier for people to get books onto those devices. Copia, the recently launched social reading platform from DMC Worldwide, also made a big splash at CES. 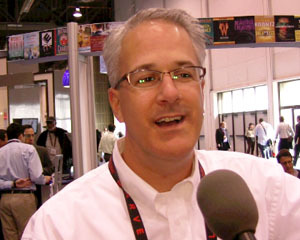 “The excitement around all kinds of digital content is palpable [at CES],” said Sol Rosenberg, VP of Business Development and Content Acquisition for Copia, “and the reason we’re here is because we’re all about partners, both hardware partners and channel partners.” Copia has certainly done a good job of finding new partners in the technology industry and announced at CES that Copia will be “the featured reading app on all the Win 7 phones and tablets” as well as Motorola’s Droid X smartphone and Samsung devices. 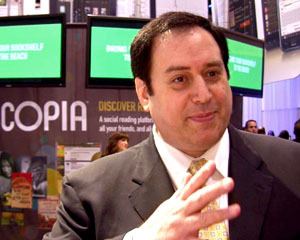 Rosenberg also noted that Copia is in the process of rolling out globally over the coming months in two phases. First, he said, Copia’s new partners — Microsoft, Motorola and Samsung — ship internationally, which automatically means reaching new customers around the world. Next, Copia will begin to work with local channel partners in markets around the world to provide local content and storefronts inside its apps. In addition to the larger presence of media companies at CES, visible trends this year included 3D and interactive television, the further proliferation of tablets (over 50 different tablets on display by some counts), and more devices using Google’s Android operating system. From e-reader manufacturers, we saw several companies offering both bare-bones, lightweight models, as well as full-feature, color readers with apps and computer-like functionality. There is certainly no shortage of devices at CES on which one can consume any and all types of content. What differentiates these devices, however, seems to be the partnerships and deals that device makers reach with media and content companies to make their offering more attractive to consumers. DISCUSS: Are Publishers Becoming Technology Companies?